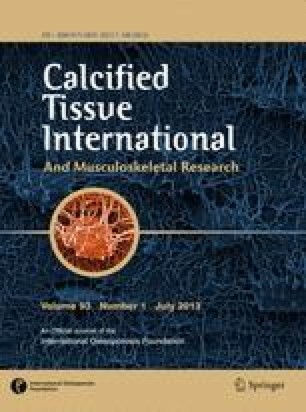 The bone collagen of human osteogenesis imperfecta is a potent inhibitor ofin vitro calcification. The inhibition was removed by treatment of the collagen with pyrophosphate in the presence of magnesium ions. Elevated levels of serum and urinary inorganic pyrophosphate were found in 28 patients with osteogenesis imperfecta. Oral administration of magnesium oxide or magnesium sulfate to four of these patients significantly reduced their serum and urinary levels of pyrophosphate. This investigation was supported by U.S. Public Health Service Grant AM 08757-05 Division of Arthritis and Metabolic Diseases. Du collagène osseux provenant de fragments d'ostéogenèse imparfaite est un puissant inhibiteur de la calcificationin vitro. Cet effet inhibiteur peut être supprimé par traitement du collagène à la pyrophosphatase en présence d'ions de magnésium. Des concentrations élevées de pyrophosphates inorganiques sérique et urinaire ont été observées chez 28 malades atteints d'ostéogenèse imparfaite. L'administration buccale d'oxyde de magnésium ou de sulfate de magnésium à quatre de ces malades diminue de façon significative la quantité des pyrophosphates sérique et urinaire. Der Knochenkollagen von Osteogenesis imperfecta-Kranken ist ein mächtiger Hemmstoff für die Verkalkung in vitro. Die Inhibition wird durch Behandlung des Kollagens mit Pyrophosphatase in Anwesenheit von Magnesiumionen aufgehoben. Erhöhte Spiegel von anorganischem Pyrophosphat wurden im Urin und im Serum von 28 Kranken mit Osteogenesis imperfecta gefunden. Wurden 4 Patienten mit peroralen Gaben von Magnesiumoxyd oder Magnesiumsulfat behandelt, so verminderte sich der Pyrophosphatspiegel im Serum und im Urin signifikant.